Right. So. Before I kick off, I just wanted to say that I’ve been really, really disappointed by Gorman this year. In April they basically flunked the World Aid Australian 2016 Fashion Report; I gave then the benefit of the doubt because they claimed that their ‘F’ rating was ‘a failure to reply, not a failure to comply’, and that they’d made the decision not to disclose information about their production practices to Baptist World Aid Australia. I thought their bungled response – a belated instagram post jumping on board the #WhoMadeMyClothes awareness campaign – was misguided, but not inherently evidence that their well-known social and ethical policy was baloney (and FYI, they recently published the results of an internal and external survey of working conditions, and it looks mostly OK). More recently they have found themselves in hot water over claims that they’ve been willfully and knowingly ripping off indie artists including Emily Green, Kirra Jamison, and Eloise Rapp. This came hot on the heels of the release of their enormously popular collaboration with Australian artist Mirka Mora and it’s one of my pet hates. Gorman does great prints. I’ve been singing their praises for years, and hoping and wishing that they’d expand their size range (they haven’t). But I think maybe the love affair is over. I don’t think I’ll be buying from Gorman again. This top is part of a current range at Gorman, and I’m hoping they haven’t been ‘influenced’ by someone for it. I loved it enough to spend nearly $100 on it (for a t-shirt for God’s sake) so I’m planning to wear the hell out of it. 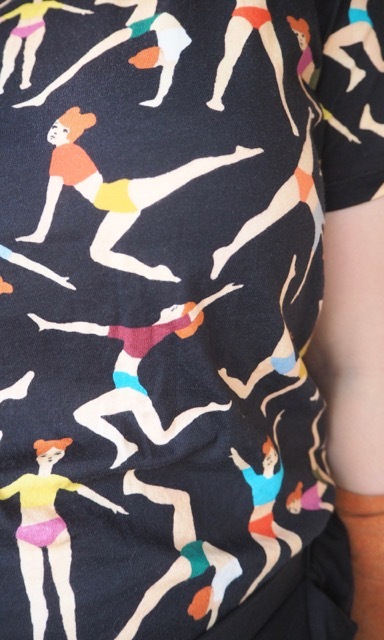 The print’s called ‘synchronised’, and it features a bunch of ladies wearing sensible knickers and doing gymnastic poses. It’s very Olympic in spirit, and it’s a great statement piece to pair with plain skirts and pants. 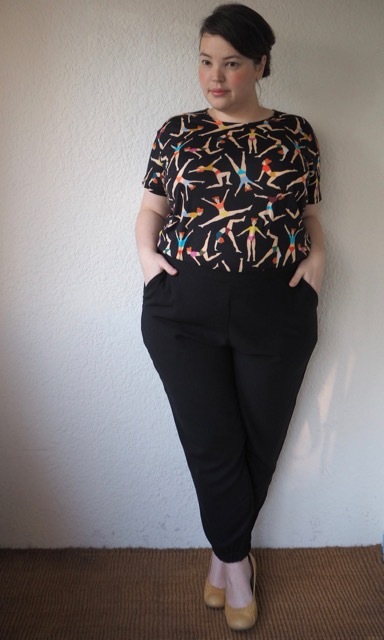 Speaking of pants; the trousers are from Love Your Wardrobe, who are a new-to-me Australian online plus-size brand that I have somehow totally missed up til now. I took advantage of their recent sale to try their cuffed-pull on pants, and I’m so glad I did. 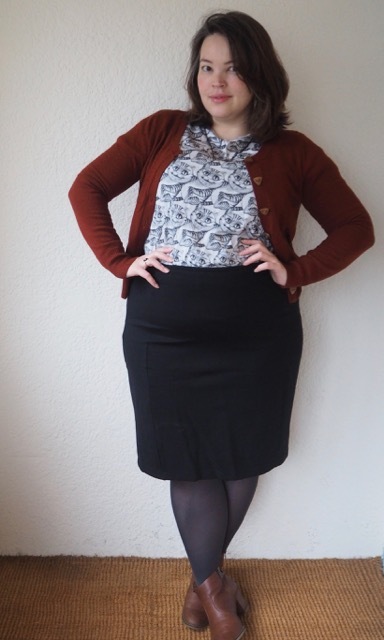 They fit beautifully – I went by the size chart, which was spot on – and are in a lovely light fabric that will be wonderful in summer. They don’t crush, fit my thighs (and giant calves! 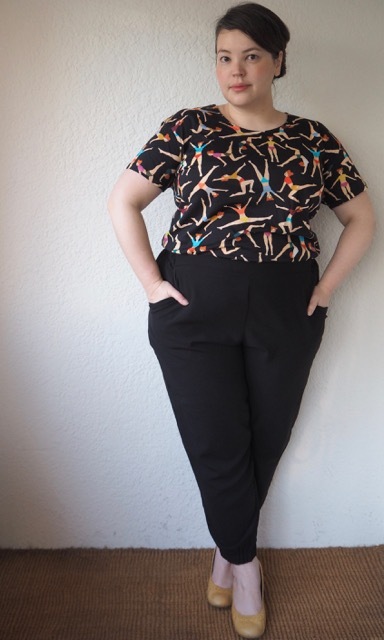 ), have fully functional pockets, and feature a proper waistband at the front, meaning I can wear tops tucked in without feeling like too much of a dag. 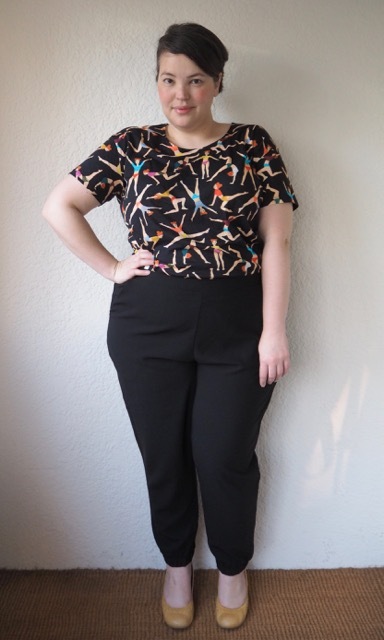 I don’t usually like to buy trousers online because the fit is much more iffy, but Love Your Wardrobe ships free, and being Australian return shipping wasn’t going to be a major problem if the pants ended up being a trainwreck. The $25 voucher you get for signing up doesn’t hurt, either. The range is fairly limited at the moment, but it’s nice to have another local store I can support. On that topic – don’t forget that this weekend is Melbourne Fashion Week Plus, and tickets are still available to see some of the exciting new players in the plus-size fashion world at one of the weekend’s four runway shows. I’ll be there, front and centre, so say hi if you see me! I’m also planning to visit the A+ Markets on the Sunday – its sure to be a huge one! 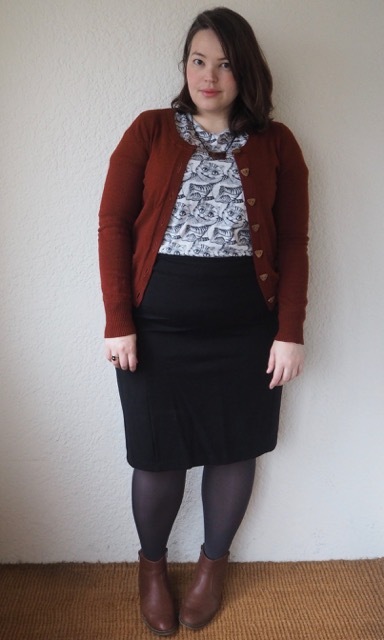 What a novelty; I’m not wearing a single home-made item today, and every single item (except the cardigan) is currently available to buy! One of the problems with blogging less often than I used to (remember that one time I blogged every single day? That was a crazy time, huh?) is that by the time something makes it on to the blog it’s often no longer available in the shops… sorry! I’ve hit that point in the season when I feel wholeheartedly uninspired by my wardrobe, so I’ve done an itty bitty bit of secret shopping, including this brilliant Cheshire Cat print tee-shirt from Uniqlo. It’s part of Uniqlo’s new Alice in Wonderland collection, and has a wonderful repeated pattern of chubby Cheshire Cats. It’s a collection based around the (frankly, terrible) live-action Alice Through the Looking Glass movie, but with the highly detailed black and white sketched style of the image I felt like it had more in common with Tenniel’s original Cheshire Cat than Disney’s stripey purple interpretation. 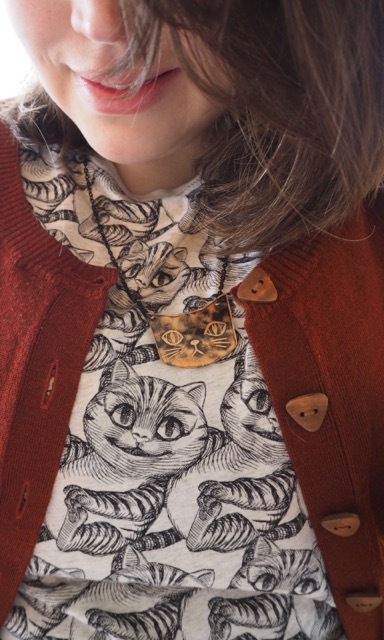 Because a tee-shirt full of crazy cats wasn’t quite enough cats for me I added the cat necklace that my friend Pam gave me for Christmas last year. 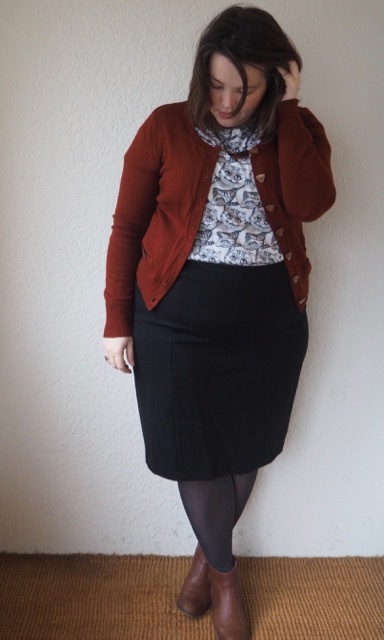 The coppery gold picks up the rich rust colour of the cardigan really nicely, and with grey tights (from Sonsee, naturally) softens the contrast between my black skirt and my brown ankle boots.